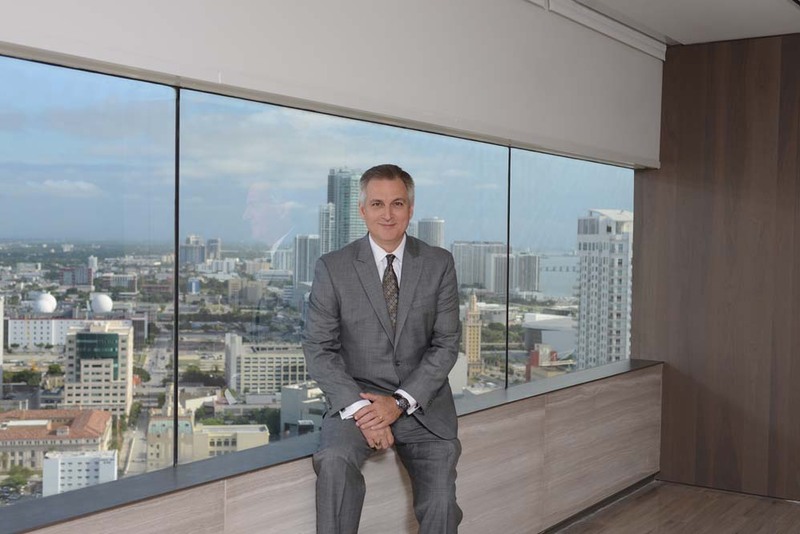 In a recent interview with South Florida Legal Guide, Jay Pelham, president, TotalBank, Miami, and the 2015-16 chairman of HistoryMiami, talked about downtown Miami’s remarkable evolution into a dynamic live-work-play community with a Manhattan vibe. Q. Tell us about your impressions of downtown Miami. Pelham: During my 27 years in South Florida banking, I have worked on Brickell, in Coral Gables – and managed a business unit for several years in Manhattan – before moving into TotalBank’s downtown headquarters last year. It is truly remarkable how much our downtown has changed for the better in the past 15 years. Q. What are some of the highlights of that change? Pelham: Downtown is now filled with apartments and condominiums purchased by U.S. and international buyers from around the world. Many of these new residences cater to young professionals, managers, executives and even retirees who like the faster pace of urban living. Today, there are dozens of new downtown restaurants, vibrant cultural institutions, supermarkets, retail centers, sports, concerts and special events at American Airlines Arena. It’s an exciting lifestyle that’s sprung up in just a few years. Q. Can you give us a personal example? Pelham: One recent Friday night, my wife, who works on Brickell, took the Metromover to our office. We walked over to the restored Langford Hotel, which retains all the charm of the 1920s. We enjoyed cocktails with a group of our friends and colleagues at the Pawn Broker on the rooftop of the hotel. Later, we had a quiet dinner at PB Station downstairs in the same building. It was a very Manhattan-like evening for us. Q. What about downtown’s working environment? Pelham: That’s changed as well. Today, about one-third of our headquarters employees take public transit to work. They ride Metrorail trains and Metrobus vehicles, or simply walk to work. We all take the Metromover loop for meetings in the downtown and Brickell areas. Q. Is that emphasis on transit something new for downtown? Pelham: As a Miami history buff, my response is yes and no. Back in the 1926, a front-page story in The Miami News declared that “Miami’s traffic jams make the worst congestion of London or New York seem like child’s play.” It’s interesting that almost 100 years later, we all lament traffic as we did in the 1920s. And today’s solution is the same as it was then: bicycles, trolleys, buses and trains. From the late 1940s through the early 2000s, those transit options were neglected in favor of the personal automobile. Now, we’ve introduced these other forms of transit including using Uber, Lyft or taxis when necessary. Q. Will transit use continue to grow? Pelham: It’s exciting to watch the progress being made on All Aboard Florida’s Brightline private rail service. By next year, it should be possible to commute by train along the U.S. 1 corridor, as well as the Tri-Rail service along I-95. That means you could work in downtown Miami and ride the train from Fort Lauderdale or West Palm Beach every day – just like millions of commuters who rely on rail transit in the New York City region. Q. What other trends do you see in the downtown lifestyle? Pelham: I think the city’s bayfront will really come to life. For decades, this has been an underutilized “green” asset. To the north, the Perez Art Museum Miami and the soon-to-be-completed Frost Science Museum will attract more downtown residents, office workers and visitors to Museum Park. You can eat lunch near the water, enjoy the public art works and see the cruise ships heading out to sea. Bayfront Park is already a popular “get-away” lunch spot, offering a quiet oasis in the midst of downtown’s office towers. Both locals and visitors enjoy Bayside Marketplace, and I would not be surprised to see an enhanced water taxi service there in the next few years. Q. What about beyond the bayfront? Pelham: Our cultural institutions will continue to grow, like the innovative programming offered by the MDC Museum of Art + Design (MOAD) in the landmark Freedom Tower. The new All Aboard Florida downtown train station will be an interesting destination itself with restaurants, stores and services for downtown workers and residents. Q. What about downtown’s office and retail markets? Pelham: Demand for office space has broadened with Miami’s growth as a hemispheric technology hub. Along with the professional firms and corporate offices, we have seen the arrival of business incubators, shared workspaces and other collaborative uses. Older buildings are being redeveloped and in some places restored for these new uses and downtown’s growing Millennial workforce. As for retail, the city’s ongoing redevelopment of Flagler Street corridor and the mixed-used Miami Worldcenter will bring renewed vitality to this sector as well. Pelham: We believe downtown is the ideal headquarters location for TotalBank, which has served Miami-Dade County for 42 years. I like to think of us as the “305 bank” because we are so closely tied to this community. TotalBank is one of the strongest banks in the nation with a deep commitment to serving the commercial and personal banking needs of our clients as our community heads into the future.